DirectoryScanner - Free Directory Server fingerprinting tool ! 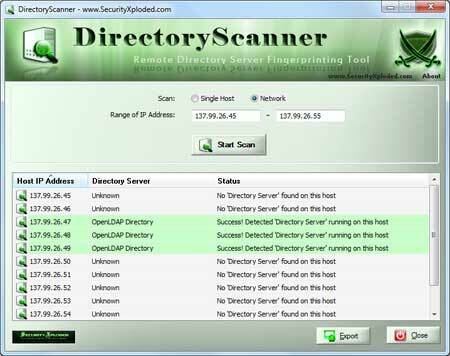 DirectoryScanner is the FREE Directory Server fingerprinting tool. It can help you to remotely detect the type of Directory servers (such as Microsoft Active Directory, Novell eDirectory etc) running on the local network as well as Internet. Also it can be used in penetration testing while evaluating client environments where multiple Directory servers are deployed. Directory servers are typically used to store crucial data in an organization including employee authentication information. Often getting hold of poorly configured Directory server can be a gold mine for the pentester. It comes with Installer which helps in local installation & un-installation of the tool. It works on wide range of platforms starting from Windows XP to latest operating system Windows7. Remotely detect type of Directory Servers in the network. Scan single or multiple systems on the network/Internet.